As Russ so delicately pointed out in his last post: I, Nathan, am an old man. And in all my long years, I have never tasted such delicious croissants. Ever. Not even in France. Granted, the croissant I had in Paris was from a sketchy street vendor guy, and it was super inexpensive. Don't get me wrong, it wasn't bad...it just wasn't this good. Apparently, Russ and Sandy had a similar experience with the Almond Croissants, a delicacy that Sonia and I haven't had the chance to try yet. But if they're anything like these pumpkin dealies, they're going to be at the top of our next shopping list. Man, where do I start? Like their almond cousins, these croissants need to thaw for 6-7 hours. I'm pretty sure the next time I buy these things, that the full thaw time won't occur...because I won't have the willpower to wait. I'm going to justify a shorter thaw time with a line of logic that goes something like this: "Because there's more heat in the oven, thawing will occur much faster if I just stick them in the oven now, and leave them in for, say...a half hour longer." And they'll come out burned on the outside and raw on the inside or something like that, and I'll be slightly disappointed, as was the case with the Chicken Pot Pie Bites. But barring that or some similar calamity, I can't imagine you won't like these. The crust was amazing. It came out golden-brown, full of air, flaky, and very buttery. The pumpkin center was just as good. 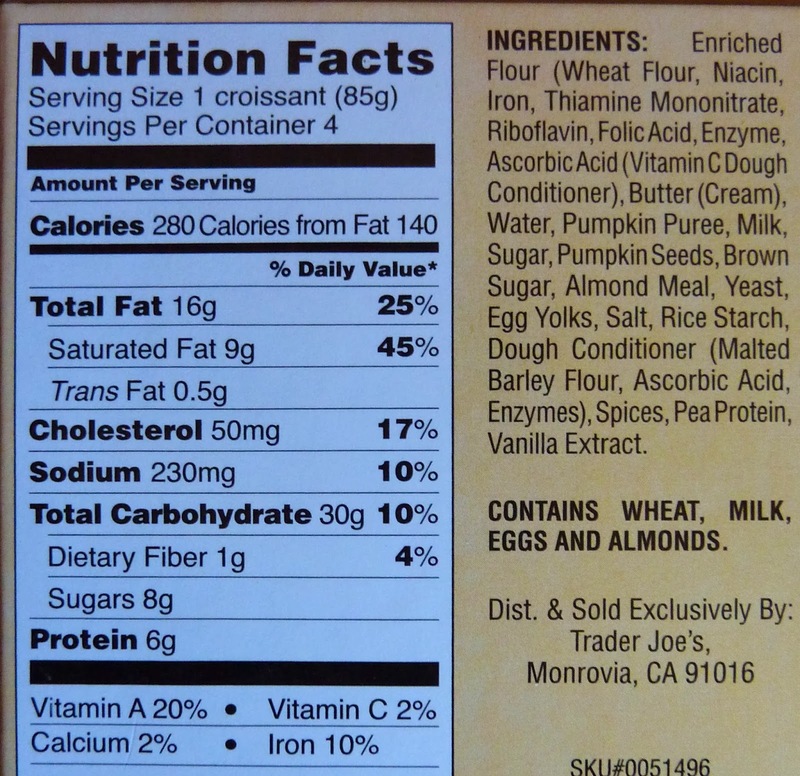 It's like hot pumpkin pie filling, but perhaps just a tad thinner. It's not overwhelmingly pumpkinny. It's just enough to balance out the bread part of the product. The pumpkin seeds add a nice element of texture, and somehow, they're the best-tasting pumpkin seeds I've ever had. As a kid, after carving our annual jack-o-lantern, my dad and I would roast all the seeds from our pumpkin, dump a bunch of salt on them, and eat them. I think the pumpkin seeds in this case have a little bit of butter and sweetness on them. I was skeptical that they'd work with something so dessert-like, but they definitely did. I guess they take the place of the almond slivers that crown the almond croissants. I think I'm overdue for a perfect score. I give these 5 out of 5 stars. Sonia gives them 4.5. Scrump-pumpkin-dilly-icious. Do it, Adam! Do it! Haven't had these, but the chocolate and almond croissants are AWESOME! Better than what you will get at a good bakery. But they do have to thaw for several hours, because the dough actually rises (they get HUGE overnight) before baking. Yes, they did grow a lot while they thawed. worth waiting the extra proofing time! I always set them out before bed and then stick them in the oven when I wake up. coffee and fresh croissants and I don't even have to leave the house?! the BEST! Agreed, Mia. It was worth the wait! How funny, I just baked these on Nov. 9. I'm a huge fan of TJ's plain mini and choc croissants, but not these. I proofed & baked them side by side with the chocolate croissants, and the pumpkin ones never rose. They expanded sideways, so they came out looking kind of mushed down. The filling was also bland (no discernible spices whatsoever). But the chocolate croissants were huge & awesome as usual! Wow, that's crazy you had such a different experience than we did. Ours definitely rose significantly. 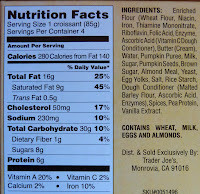 And we've had our share of bland stuff from TJ's, but not these! Nice, photo helps in a food review. I doubt you'll find any, Pauline, but happy hunting! I've got to say, I'm a huge fan of TJ's croissants (especially the almond) and a major pumpkin-aholic, so I thought I'd love these. My reaction was more "meh." Bland. 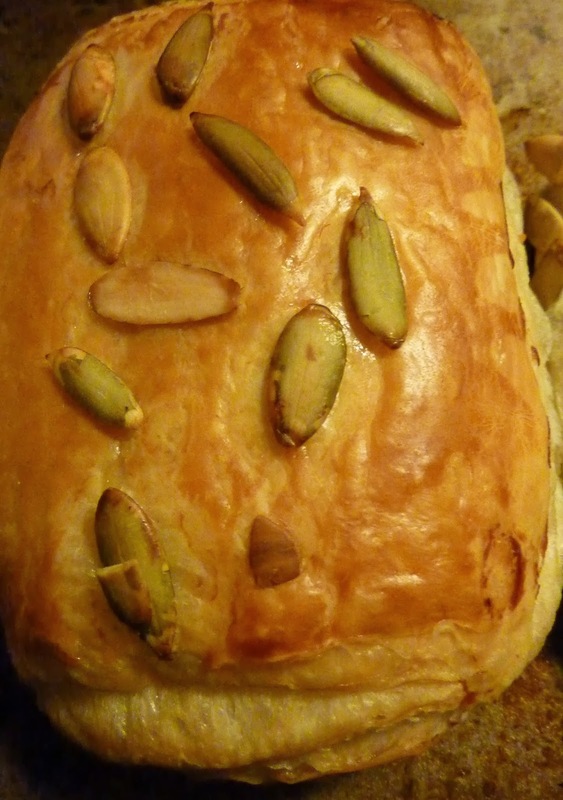 The pumpkin seeds on top didn't seem to go (a light glaze maybe). Wouldn't get 'em again. They're way better if you don't smoke crack before you try 'em, www.writegrantproposals,com! 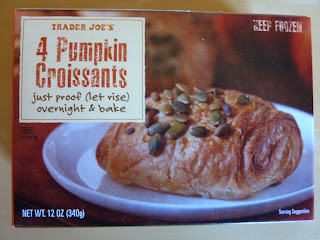 Tried these during the holidays and they were very good but the almond croissants are still my favorites. Also really liked the Kouigns Amann, crispy and very buttery! I made these for the first time. I was making an omelette, so I brushed the risen "croissants" (they are not crescents but rectangles) with a little beaten egg to make the top shiny. On each croissant, the side with the outside edge of the bottom layer rose a little more than the other side and spread out during baking, so the pumpkin seeds ended up being on half of the top. I cooled them on a wire rack when I removed them from the oven. The top was light and crispy, but the bottom was softened by the moist filling and was not crisp. I liked the taste of the filling but I prefer croissants that are crisp on the top and bottom, so I think I will not buy filled croissants again. I really liked the pumpkin seeds on the top.